If you’ve ever fussed with heat lamps, cold drafts, warm days risking overheating, and tiny baby chicks in a brooder, you know how frustrating the brooding process can be – and finding a hen to adopt your chicks and do the temperature regulation for you becomes a tempting idea. When my chicks came home, I settled them in a temporary brooder (a rubber made tub) in my garage and waited until about 11pm to attempt any transfer. In the middle of the night, well after my broody hen was settled for the night, I put a few chicks in my pocket, donned a red-light headlamp and quietly entered the stable and opened the hen’s cage. quietly and quickly I covered her head with a thick handtowel, to keep her quiet and in the dark and to prevent pecking, and carefully slipped the tiny day old chicks underneath her. Although I had over two dozen chicks, wanted to test my broody hen’s willingness to adopt pre-hatched chicks with just a few chicks just in case she rejected or mistreated the chicks implanted into her nest. When I entered the stable the next morning, I could tell from the contented conversation coming from the nest that implantation had been successful. Upon investigation all the chicks were tucked cozily underneath the hen and adoption was a success! 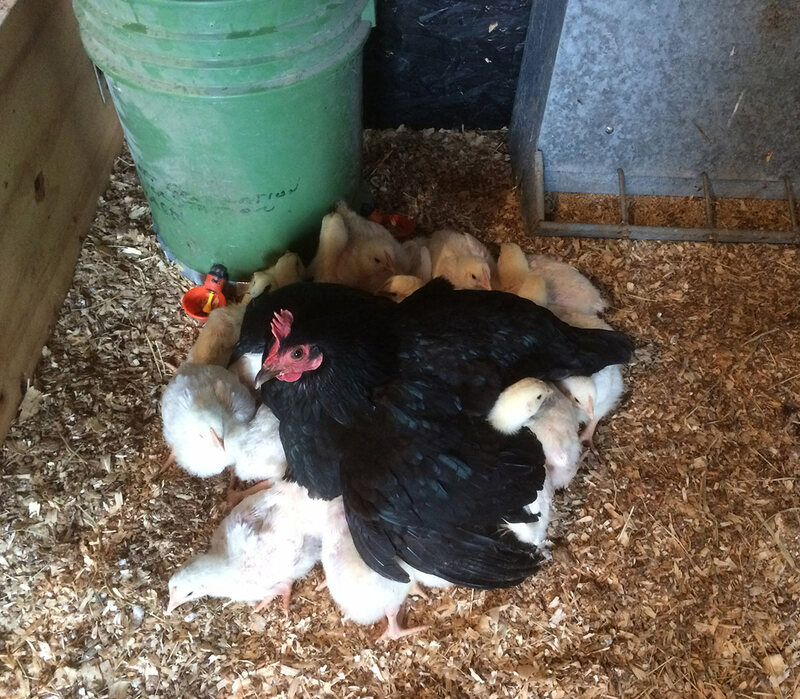 By and large, this experience of encouraging my broody hen to attach to hatchery chicks was wildly successful, however, there were some early losses. I attempted to get my hen to adopt 33 chicks and lost 3 the first week. While I wasn’t able to troubleshoot causes individually, it appeared that they were suffocated or accidentally stepped on by the broody hen. After the loss of the third, on day 4, I simultaneously removed the bucket from the nest (to increase air flow from all sides and hopefully prevent suffocation) and added a heat lamp in another area of the nest, so the chicks might not be so inclined to squash so tightly together around the hen. One or both of these efforts were successful, and no more chicks were lost until week 4 when the genetic frailty of Cornish Crosses began to surface. Banty Hen sheltering cornish cross chicks under her wings. I love your story. I tried that twice. Once with success, one with failure. The success was the hen’s eggs started hatching. 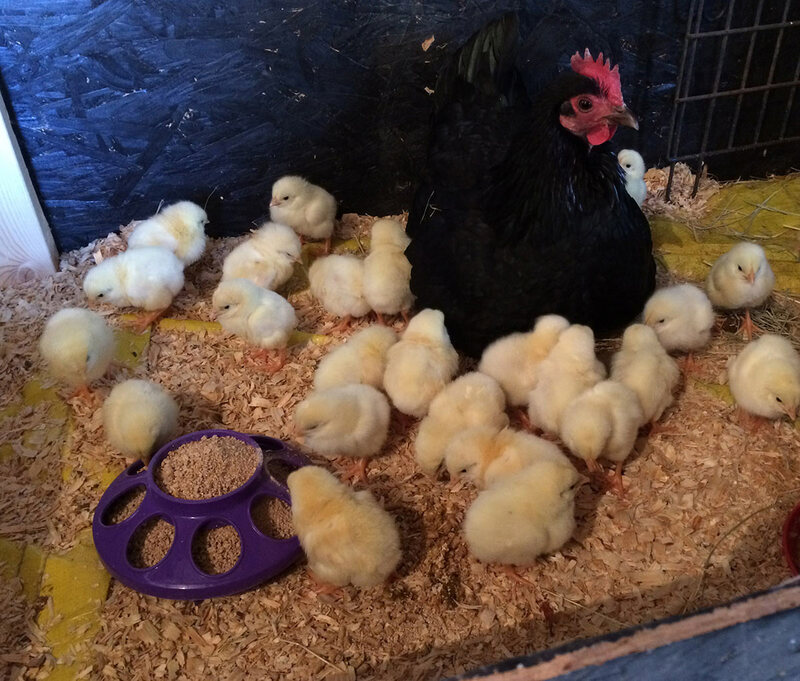 I went to the store and bought the chicks I wanted and incorporated them with hers as she was hatching eggs. She raised them all with no problem. Failure was hen setting on infertile eggs. I let her set awhile and then started placing chicks. That did not work. She wanted no part of them. I like your idea of putting a covering over her eyes.